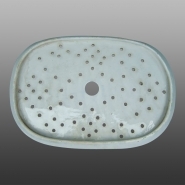 Shown here is a meat drainer also printed with the Beemaster pattern. Here is a view from the reverse side of the drainer. 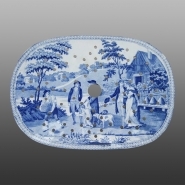 An earthenware meat platter printed in blue with the Beemaster pattern. The original maker of this sought after pattern has yet to be definitively identified. It is believed to have been produced by several potteries. The source print is shown below.